Item currently on backorder, due late May, 2019. 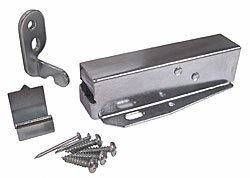 The "Tutch-Latch" eliminates the need for exterior pulls or knobs. It positions at the side, bottom or under-shelf. Simple installation with supplied template. For best operation, the case should be mounted level. Screw holes on 1" centers. Note: This product is also known as SPH-266, 266 on other websites. Warranty: 1 year limited warranty on hardware with Lifetime finish guarantee.